Fortnite players are getting a new way to heal in the battle royale’s latest patch. As well as bandages, medkits, apples, and cozy campfires, new healing stations will be dotted around the map following the arrival of the game’s upcoming patch. They will, thankfully, be somewhat familiar. 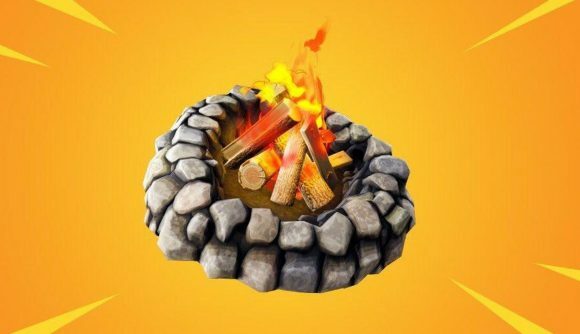 The new healing mode – referred to in the patch notes as environmental campfires – look awfully similar to those cozy campfires I mentioned above. The catch is that rather than being able to place a campfire on any flat surface you please, as is the current system, environmental campfires will be situated in set points around the map. From there, however, it’s all pretty recognisable. Once you’ve activated a campfire, you’ll be healed as long as you stay close enough to its warmth. The campfires will restore a maximum of 50 HP to all nearby players over 25 seconds. Annoyingly, however, each spot can only be used once, so no single location will be able to heal you fully – you’ll be able to tell if a campfire’s been used by whether it’s still got wood in it. As well as the campfires, the patch adds the chaotic bottle rockets to the game, which are perfect for whittling down your enemies’ offences – you can check them out in the brief trailer below. Other changes are relatively minor, with tweaks to the drop rates of dynamite and rocket ammo, and an increase to the strength of launchpads. And as the snow starts to thaw, Sneaky Snowman are sadly on the way out. The latest update should be live now, meaning you can huddle round the brand-new campfires straight away. Unfortunately, I don’t yet know where they can be found, so you’ll need to hunt them out for yourselves.